There are still communities in the Chicago land area with houses utilizing oil fueled heating or converted to gas heating appliances with oil tanks remaining on premises. 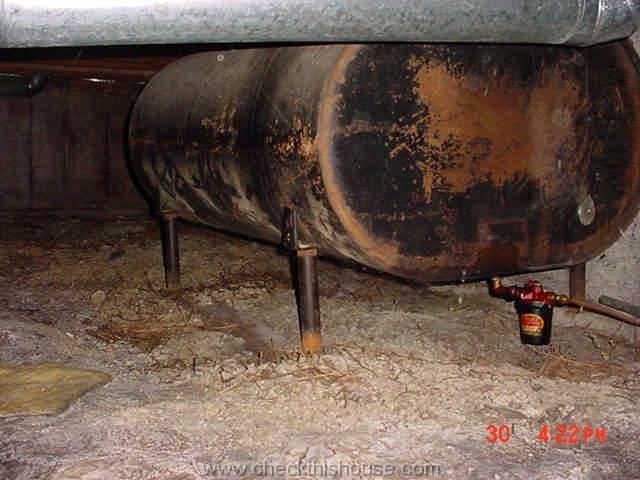 I’ve seen several abandoned oil tanks in basements and crawlspaces (in a few thousands of properties I’ve evaluated, not one had an active oil fueled heating system, but I was lucky to accidentally discover a couple of underground tanks), and in some of those situations, property owners didn’t even know about them (at least that was my impression). 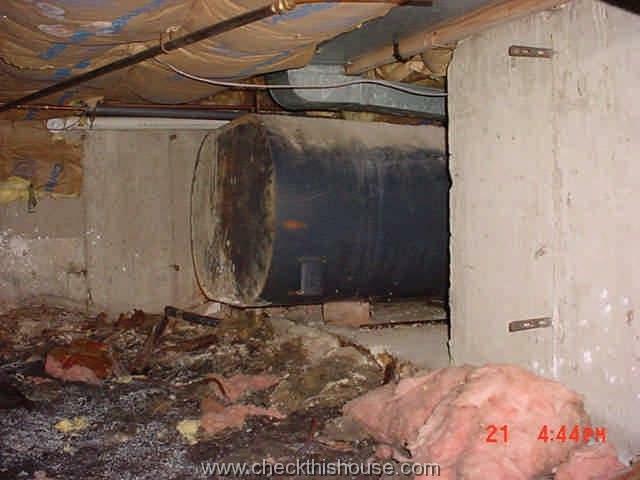 For underground oil tanks, spotting one would be an accident, pure luck, or curiosity – unexplained old pipe(s) above the ground or in the basement wall, unpleasant oil smell, indent in the ground, and/or dying vegetation in just one area. Oil tank in the basement – it’s obvious, you can’t miss it, and for crawlspaces – it’s just another proof that we don’t care what’s in it. Any above the ground oil tank is easy to evaluate and significantly cheaper to remove (if you’re forced to do it by a potential buyer of your property) than an underground oil storage tank. 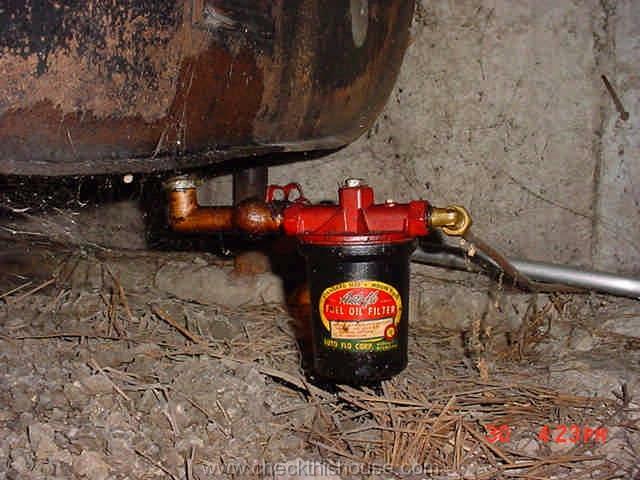 Because there’s always a chance that oil has leaked through one of the pipe connections, filter, shutoff valve or corroded tank body, the surrounding area should be carefully evaluated for oily stains – don’t forget to examine the bottom portion of the tank, where most of the leaks occur. There might still be a gauge installed on top of the oil tank showing the amount of fuel inside (assuming that it’s functional). You can also try tapping on the oil tank walls and listening to the sound pitch change – it should be different on full and empty section. If top of the oil tank is accessible and there’s a removable cap, you can insert a long stick into it to determine amount of fuel inside the tank. Leaking oil tanks are definitely an environmental hazard. Oil should be disposed of at an EPA approved landfill – PLEASE don’t dump it into the drain! The oil tank interior can be cleaned professionally and then it becomes just a large, useless piece of metal – scrape it and make some money. Some of those tanks are larger than any openings in your basement and were probably welded together from a few sections on the spot. If necessary, they can be cut into smaller pieces and then recycled. Although the state of Illinois (in general) does not require single family home and duplex owners to remove abandoned oil tanks, some local communities might enforce such laws, so give them a call if you’re in doubt. For underground oil tanks, any action you decide to take will have a slightly higher price tag, because of the accessibility and possibility of soil contamination. If an underground oil storage tank (short name – UST) has been previously emptied, it poses no environmental hazard and your local authorities are not enforcing mandatory removal, I would recommend to have it filled with an absorbing foam or another approved filler (like sand or concrete), which might be cheaper than digging it out. Corrosion of an old, underground oil storage tank might eventually cause it to collapse and you wouldn’t like to be standing on the top of it. However, if soil (or sometimes water, if you have your own well) testing confirmed contamination, you would most likely have to make oil tank removal and remediation arrangements. Illinois EPA (Environmental Protection Agency) has a special program for the underground storage tanks removal … but unfortunately it doesn’t cover residential and farm heating oil tanks, and the money comes out of your own pocket. These 3 Q&A’s below have been taken from the Illinois EPA (Environmental Protection Agency), and you can read entire FAQ section here. Q. Is my residential heating oil tank regulated by the Illinois EPA’s Leaking UST Program? A. No, residential and farm heating oil tanks (that is, tanks used to store heating oil for consumptive use on the premises where stored and which serve a farm or residential unit) are not, by definition, USTs and, therefore, are not subject to the Leaking UST Program regulations. Q. If there is a release from my 100-gallon UST, am I required to follow the Leaking UST Program regulations? A. No, any UST system whose capacity is 110 gallons or less is excluded from the Leaking UST Program requirements. Q. I have an aboveground storage tank (AST) on my property. Is it regulated by the Illinois EPA’s Leaking UST Program? A. No, ASTs are exempt from the Leaking UST Program requirements. The Office of the State Fire Marshal’s (OSFM) Division of Fire Prevention regulates the operation and maintenance of ASTs. Well, I’ve searched Internet for Illinois Oil Tank removal company, and there isn’t many to choose from, actually there’s only one that pops out in every search: Cicero Oil Company so if you need a professional to answer your oil tank questions, give them a call … and let me know if there’s any other established company on Illinois market digging out oil tanks. More information about oil tanks on Illinois EPA website … actually most of that stuff concerns commercial oil tanks. Residential concerns should be addressed to Office of the Illinois State Fire Marshal (OSFM). 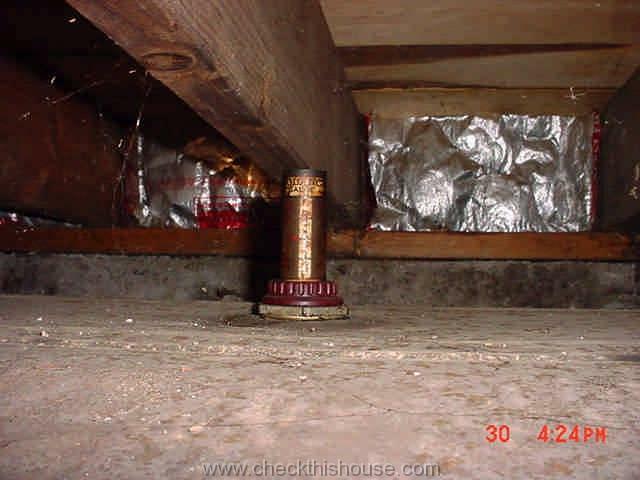 I am buying a house with a iol tank the first time I saw the house no smell but the second time I smell iol in basement there is a copper tube coming up from basement floor but the tank is empty. the realtor told me that when the tank is empty it smells heavy becouse its pumping air from tank. does that sound right to you. Now the copper tube coming through fl would that be a undergound tank. and does it need to come out of the house.